Oven Roasted Garlic Artisan Bread Recipe - Simple, Delicious Flavor! Oven roasted garlic artisan bread – the combination of two of our favorite foods. This week, as we prepared to make our homemade artisan bread, we decided to add in an additional splash of flavor with garlic from our garden. We roasted the garlic first to replace the bold flavor with a much sweeter, yet savory flavor which was the perfect addition to our bread to add another depth of flavor. There isn’t much preparation in making this oven roasted garlic artisan bread recipe – but you definitely must be patient, as there is a lot of ‘wait’ time. 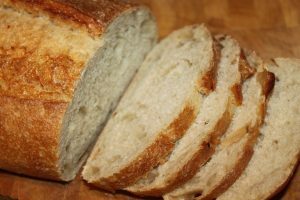 We find that making our bread on a day when we will be at home doing chores or projects is the perfect time to make this recipe. A good baking stone can really make the difference in getting breads to turn out with that perfect crust. As always, we look for ways to add additional flavors to our bread recipes, so please feel free to share your favorite way to prepare (or eat) artisan bread! 1. Roast a head of garlic by cutting off the top of the garlic to expose the cloves. Drizzle with 1-2 teaspoons of olive oil. Cover and roast at 400°F for 30-35 minutes or until tender. 2. Combine warm water (approximately 110 degrees), yeast, salt & garlic in a large bowl. Stir until most of the yeast dissolves. 3. Stir flour into water mixture until combined. This will be a very wet dough. Cover with a clean towel and set on counter to rise for approximately 2 hours. 4. After the initial rise, the dough should have doubled in size. Sprinkle some flour on top of the dough and flour your hands. 5. Portion the dough into 2 equal pieces. 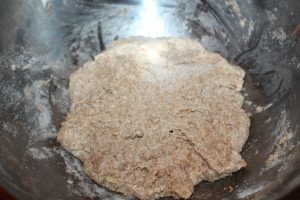 Adding flour as needed, shape the dough into a round loaf. The other portion of dough may remain in the fridge until ready to use or you can bake both! 6. Place the shaped loaf onto a floured pizza peel or wooden cutting board. Let rise for 40 minutes. 7. Preheat a baking stone by placing it on the top rack placed in the middle of the oven. Place a broiler pan/metal pie pan on the second rack directly under the baking stone. Dust the stone with cornmeal to prevent sticking. 8. After the 40 minute rise is complete, transfer the loaf to the preheated baking stone. Pour 1 cup of hot water into the broiler pan/pie pan. This water will create steam that will result in a very crusty loaf. Allow the bread to rest prior to cutting. To receive our Recipes, DIY and Gardening articles each week, sign up to follow the blog via email in the right hand column above, and “Like” us on Facebook, or follow us on Twitter. You can also check out our newest book, Growing Simple, now available on Amazon.com. This post may contain affiliate links. 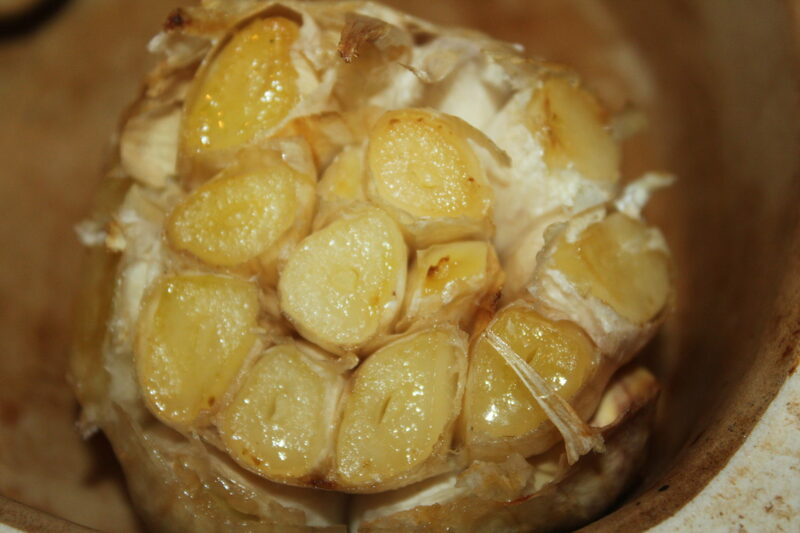 Roast a head of garlic by cutting off the top of the garlic to expose the cloves. Drizzle with 1-2 teaspoons of olive oil. Cover and roast at 400°F for 30-35 minutes or until tender. Combine warm water (approximately 110 degrees), yeast, salt & garlic in a large bowl. Stir until most of the yeast dissolves. Stir flour into water mixture until combined. This will be a very wet dough. Cover with a clean towel and set on counter to rise for approximately 2 hours. 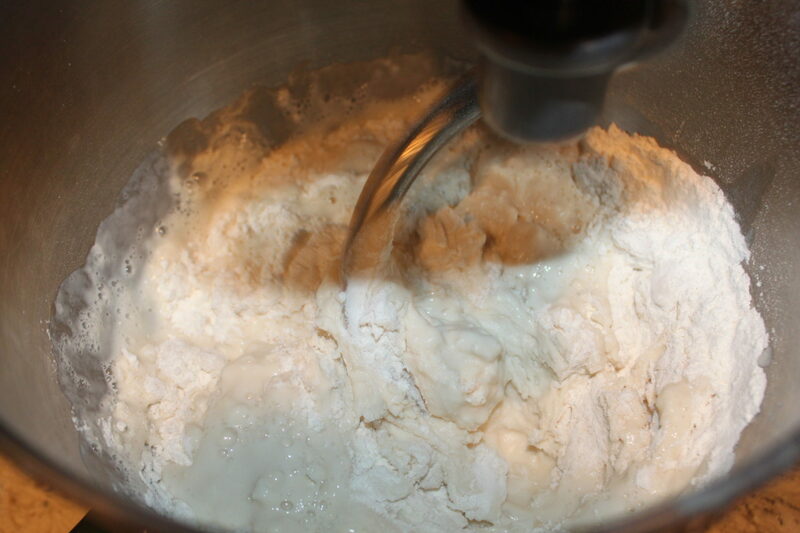 After the initial rise, the dough should have doubled in size. Sprinkle some flour on top of the dough and flour your hands. Portion the dough into 2 equal pieces. Adding flour as needed, shape the dough into a round loaf. The other portion of dough may remain in the fridge until ready to use or you can bake both! Place the shaped loaf onto a floured pizza peel or wooden cutting board. Let rise for 40 minutes. Preheat the oven to 450 degrees. Preheat a baking stone by placing it on the top rack placed in the middle of the oven. Place a broiler pan/metal pie pan on the second rack directly under the baking stone. Dust the stone with cornmeal to prevent sticking. After the 40 minute rise is complete, transfer the loaf to the preheated baking stone. Pour 1 cup of hot water into the broiler pan/pie pan. This water will create steam that will result in a very crusty loaf. I noticed I had to add alot of more flour too as it was like soup after the 2 hour rise… but just by adding more flour it turned out great although I only got 1 medium loaf out of the recipe. It was gone that night. My husband wolfed it down Haha… so yesterday I made another and added your suggestion of total of 4 1/2 cups and it was perfect, I also added a tbsp of finely chopped FRESH rosemary. Plus we are big garlic eaters so I did 2 bulbs…. so good. 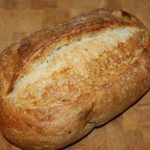 This recipe is one I will make often and since christmas is coming up and family home with dairy allergies and others that are vegan and vegetarian… this is the perfect bread. 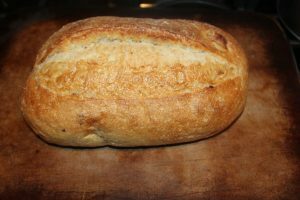 Thank you MD for your suggestion and to Old World Garden Farms… best recipe for this bread. Is the ratio of water to flour correct? I had to knead in quite a bit of flour in order to shape loaves. When I looked at your larger recipe and set up a ratio equivalent, it works out to 4.5 cups flour for 2 cups water. The pan of water on the bottom rack allows for more of a crispy crust. It’s not absolutely necessary but is recommended. Yes – in this loaf we used half wheat and half white. I noticed no difference in texture as compared to all purpose. I know the recipe says all purpose flour, but curious if you threw in some whole wheat. Only asking because of the picture of dough, looks not as white as it would be with all purpose. Looks delicious, thanks for such complete instructions. Can this dough be frozen before baking? Nothing in the directions says to chop up the garlic after roasting. Looks like full cloves. Does it go in the bread like that??? Oh my, this looks so yummy, I can almost smell and taste it! :) I have a stupid question: If I don’t pour water in the pan what will happen to the crust? I don’t have a pizza stone so I’ll just use a pan.